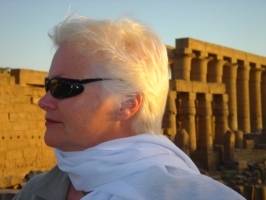 Kathleen, Queen of the Desert › Where Do Good Ideas Come From? I think on my feet, while I wash up a cup, tidy a drawer, drink a cup of tea, but my mind is not on these activities. I find myself in the chair by the machine. I write a sentence . . . will it stand? But never mind, look at it later, just get on with it, get the flow started. And so it goes on. I walk and I prowl, my hands busy with this and that. You’d think I was a paragon of concern for housekeeping if you judged by what you saw. Where do good ideas come from? Ideas for many writers come to them when they’re far away from the legal pad, the typewriter, or computer. While walking, driving, or, as Ms. Lessing describes, cleaning house, sometimes the ideas flow. I found the answer [to how and what to paint[ when I joined a school of painters in Paris after [World War I] who called themselves neomeditationists . . . They believed an artist had to wait for inspiration, very quietly, and they did most of their waiting at the Café du Dôme or the Rotonde with brandy. It was then that I realized that all the really good ideas I’d ever had came to me while I was milking a cow. So I went back to Iowa. Once you know what stimulates your creativity, your memory of things important, it may become your standard writing practice. When you need an article idea, you go do that activity. Is it puttering in the kitchen, gardening, exercising, or nursing your baby? For me, it has often been during my daily walk that I find ideas. My forays around the suburban neighborhoods, malls, and small-town streets of my former residences have stimulated many of my own Connections articles. My brisk steps on the cemetery pathways near my present home give me titles and articles ideas now. When I’m stuck in the middle of writing, the solitude, quiet, and rhythm of my legs often seem to break up the mental logjams. Whether your good ideas come from walking, cleaning, or milking a cow, they’re always welcome as submissions in Connections. This was written by admin. Posted on Friday, January 12, 2007, at 5:34 am. Filed under La Leche League. Bookmark the permalink. Follow comments here with the RSS feed. Post a comment or leave a trackback.